101Darley Beauty Collective specialise in men's and women's facials. Our staff are all highly qualified Beauty Therapist. We are lucky to have some of the worlds leading skincare on board with Dermaviduals. We have alot to offer from relaxation facials, enyme therapy, infusion facials, microdermabrasion, LED therapy, skin rejuvenation and much more. Please feel free to let us know about your concerns and we can best accomodate the facial for you! A true favourite with clients.Your classic one hour facial is customised to your specific concern of age defying, radiance boosting, pore refining, deep hydration or calming relief. Inclusive of a face, neck, shoulder and scalp massage. Indulge in this luxurious facial treatment. All of our facials are customised with the worlds leading skincare, Dermaviduals. This treatment has all the bells and whistles of the Classic Revitalising Facial but is upgraded with ultrasonic infusion followed by a customised power mask to aid in healing, rehydration, rejuvenation and lifting. Walk out floating and glowing! Awaken and hydrate. Oxygen therapy has been used for many years to hydrate and rejuvenate tired complexions. This cool, soothing treatment combines oxygen therapy with professional strength serums to instantly brighten and lift, making it a perfect treatment just before a big event! Get your glow on! Excellent for overall skin rejuvenation. A deep yet gentle exfoliation. Perfect for congested skin, pigmentation, fine lines and extractions of whiteheads and blackheads. Improves blood and lymph flow. Followed by either LED Therapy or infusion depending on the skins needs. A professional salon peel mask to regain smooth, plumped and luminous skin using active ingredients to focus on the anti ageing process. Excellent for ageing, sun damaged and devitalised skin. Includes vitamin ampoule, eye collagen mask, eyelash tint, eyebrow brow wax and tint. Lactic or Glycolic Peel Treatments may be used to assist with treating fine lines, areas of dryness, uneven pigmentation and acne. Regular peels can improve the freshness and smoothness of the complexion, improve texture, stimulate collagen renewal, reduce congestion, and assist with the absorption of other products. A series of peels is recommended to achieve optimal results. Uses a cutting edge process to enhance the penetration of vitamins into the skin. Concentrated, with ampoules and serums scientifically targeted products used within this facial can offer effective treatments for thin skin, uneven skin tone and texture, fine lines and wrinkles, and pigmentation. Includes eyebrow wax. Ultrasound therapy is actually high-frequency soundwaves emitted onto the skin and absorbed by the cells. 1MHz ultrasound is safe for using on the face and neck areas as it only travels around 3-5mm into the skin. The ultrasound should always be moved briskly around delicate areas such as under the eyes, the neck and forehead, avoiding the thyroid area. The absorption of ultrasound waves into the cells helps to increase the metabolism of the cells. This in turn stimulates the production of collagen, helps firm the skin, improves skin elasticity and leads to clearer more youthful looking skin. Ultrasound therapy can be used on its own (although the treatment time is only around 5-10 minutes) and can also be used in conjunction with other popular facial therapies like microdermabrasion, hydrabrasion and LED phototherapy. In general, ultrasound can react in a variety of ways once entering the body. Muscles and tendons will absorb the ultrasound waves. Harder surfaces like bones will tend to reflect the ultrasound waves. As ultrasound enters the tissues and is absorbed and reflected, a thermal energy (heat) is created. The effect of producing ultrasound within the device will also cause heat to be emitted from the conductive plate. Heat energy, or thermal energy causes a temperature rise in the tissues which increases the need for oxygen to the cells. This action also stimulates the lymphatic system to aid in the removal of waste products. The onset of acne and blemishes may be avoided by the effects of this antibacterial cleansing action. Results can vary by individual and skin type, and are usually gradual although an immediate clarity to the skin can usually be seen. Each person responds at different speeds to the treatment. Most people see initial results in 4 to 6 weeks, but many see results in as short time as 1 to 3 weeks. Ultrasound can provide a firming effect which is popular for sagging necks and jawlines. Generally the results of skin firming will be more prominently seen after several treatments. Results are cumulative and often long-lasting. 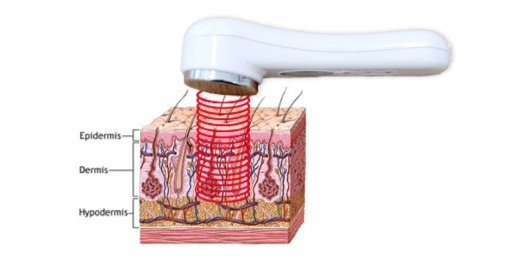 • Ultrasound works by stimulating the cells within the dermal layer. It promotes oxygen increase to the areas treated and allows better absorption of nutrients from skin care application. Results will be two-fold: working from deeper within the skin layers and working from the outside of the skin with nutrient absorption. The use of vitamins and serums during the treatment can increase the results desired and are highly recommended for even better results in a faster timeframe. Ultrasound therapy is safe for all skin types (excluding those contraindicated). It has been used safely for many years in numerous medical procedures, medical spas, by aestheticians, dermatologists and consumers around the world. Ultrasound facials are considered a safe, easy, gentle skin rejuvenating technology. To complete a treatment it is advisable to apply a nourishing and hydrating moisturiser. Scars, wrinkles and stretch marks are something that we all have to deal with sooner or later. And sometimes we think that these three things are separate and unrelated skin conditions that should be dealt with separately. What we fail to realize is that the three are quite related to each other as they have the same underlying possible causes: the lack of the skin fibers provided by collagen and elastin which are the main determinant of skin suppleness and elasticity.Your skin begins to sag over time and the elasticity of your skin begins to show the signs of aging from things like stress, smoking, alcohol use, chemicals, toxins and the environment. We all fight the passage of time as it wears on our skin and some of us do not want to result to invasive facial procedures. 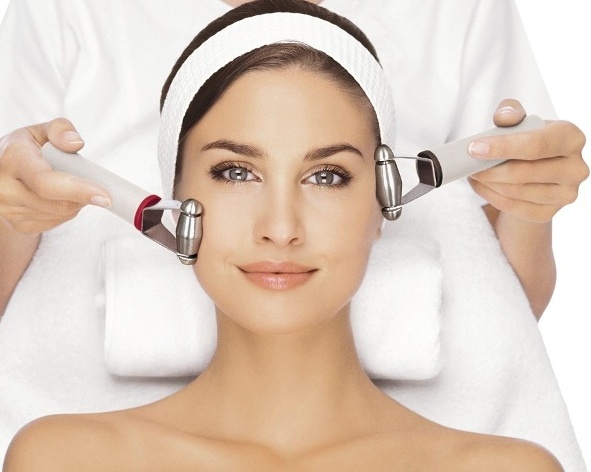 Clarify your complexion and fight the signs of ageing with the advanced technology of the Galvanic Spa Facial. Think of it as a mini iron getting rid of those wrinkles. The Galvanic Current adjusts to your individual skin needs and works together with the Galvanic Spa Facial Gels to drive the ingredients deep within the skin, and to remove any impurities and pore clogging debris. For more than 50 years, spa and salon professionals have used gentle galvanic currents to refresh and energize the skin. A recent study has shown that after a Galvanic Spa Facial the skin is 70% more receptive to skin care ingredients for 24hours after the facial. Galvanic Facial Spa, helping to enhance the delivery of pro-collagen peptides. These peptides help reduce the appearance of moderate to deep lines by sending age reversing signals to collagen-producing cells. For those who suffer from acne, this treatment can help remove sebaceous blockages and clear congestion that leads to breakouts. Because of its purification stage, the removal of impurities, and how it calms, heals, and soothes the skin, its great for acne prone skin types. A hydrating and nourishing substance needs to be applied during the facial process in order for those with dehydrated skin. Best when used with skinstitut or clairderm acne line. Restore your skin’s natural vibrancy, reduce fine lines, enhance hydration, and revive tired looking skin with anti-aging ingredients and the use of galvanic current. In this facial a face lifting masque and face toning massage is included. This treatment helps to tone and firm skin on the face, neck, & decollete. Notice an improvement in overall skin smoothness with one treatment.